Fresh from the bowels of the SEAT – Cupra split comes the Cupra Ateca, a rebadged model with the typical tuner enhancements. Highlights include a considerable horsepower increase, mild revisions to the exterior, plenty of Alcantara inside, and a swath of standard features suited for what would have been the range-topping model of the SEAT Ateca range. Of Course, there’s a lot of ground for the Cupra Ateca to cover when you consider the sheer size of the compact SUV Market. Sure, there aren’t a lot of performance compacts out there, but the Cupra Ateca will be fighting for dominance against vehicles like the Porsche Macan, BMW X3, and Jaguar F-Pace, all heavy hitters that could make things for the new kid on the block a little more difficult. So, let’s see what the new Ateca brings to the table and just how well it stacks up against the competition. The Cupra Ateca is clearly a rebadged model, but Cupra has managed to walk a fine line between doing too much and too little with its first model. To put it simply, exterior enhancements are found in all the right spots. Compared to the model it is based on, you’ll recognize that nose, and the Cupra even features the same grille mesh, but that mesh is carried over in the corner intakes. Those, of course, look a little larger not because of the redesign but because the Cupra Ateca lacks the fog lamps found on the SEAT models. The low lip has also been revised, featuring a sportier air dam with secondary air intakes in the corners. The side profile doesn’t change at all, but you should take note of those exclusive 19-inch diamond cut alloy wheels. Around back, most of the usual SEAT DNA remains, but there is an all-new diffuser to offer up a fresh look along with those rather strange openings between the rear deflectors. 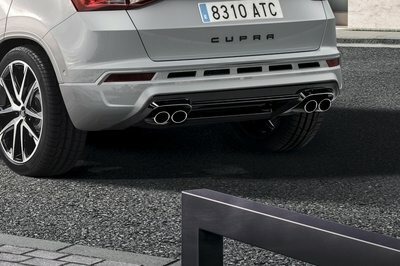 By the way, the Cupra Ateca also gets twin, dual exhaust outlets – a hint at the extra power made possible by the engine stashed under the hood, but we’ll talk more about that later. You wouldn’t be judged if you looked at the inside and said: “that’s just a SEAT Ateca.” In fact, we did the same, but when you actually look, there’s a lot of fresh going on here. For instance, the seats and door panels get healthy doses of Alcantara, while the steering wheel is wrapped in perforated leather. The seats, trim panels, gear shifter, and steering wheel are all held together by grey contrast stitching to add a little extra pizzazz to the interior. Of course, you’ll find Cupra branding here and there, including on the steering wheel, floor mats, and infotainment display. The door sills even get an illuminated Cupra logo to remind those who enter just what they are getting into. The eight-inch infotainment screen carries over from the SEAT Ateca, but it gets custom software that includes a Cupra logo upon entering the vehicle, and there’s a performance page as well. The instrument cluster is all digital, featuring a central tachometer and digital speedometer. All other relevant data shows up on either side of the display. Things like keyless entry and keyless start round out the interior package. Under the hood of the Cupra Ateca lurks the EA888 2.0-liter mill straight from the Volkswagen Group. This powertrain is a turbocharged unit that delivers 296 horsepower and 295 pound-feet of torque, a hair more than the torque delivered by the SEAT Leon Cupra 300. Power is delivered to all four wheels via a refined, seven-speed DSG gearbox a SEAT’s 4Drive system. This system, provides a number of selectable drive modes, with the most important being “CUPRA” mode, which, of course, opens up engine response and revises the adaptive suspension for sportier handling. Unfortunately, there are no plan for the Ateca to receive a manual transmission, and the 4Drive system is biased to the front with torque being sent to the rear only when needed. According to Cupra, it can hit the 62-mph sprint in all of 5.4 seconds and will top out at 152 mph if you keep on it. The adaptive suspension is top notch and is actually a bit lower than that found on the SEAT model, but not by much – just 20 mm. The spring rates, however, have been considerably revised and the suspension is firmer overall. The adaptive suspension is standard equipment, while the electronic sound synthesizer that’s typically offered on MQB-based models has been dropped. The standard brake setup comes with 17-inches on all corners, but if you go for the performance pack option, you can get Brembo calipers and 18-inch discs for extra stopping power. 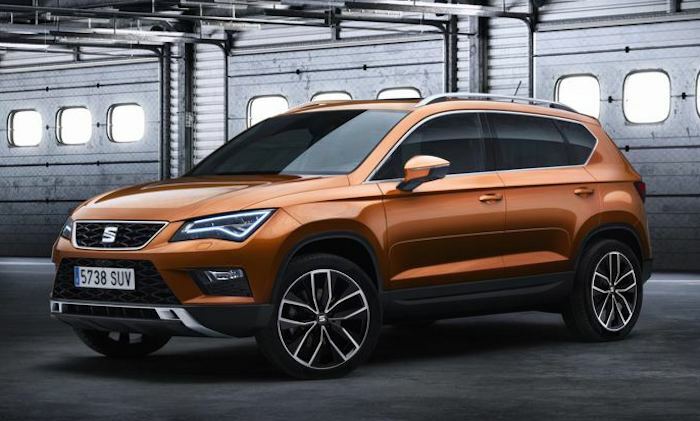 There is no word on pricing for the Cupra Ateca, but you can expect it to start out around the $50,000 to $55,000 range. This would put it somewhere around $8,000 higher than the range-topping SEAT Xcellence, a fair price when you consider the 90+ horsepower upgrade and extra niceties inside. As luck would have it, there isn’t really a lot the Cupra Ateca will compete directly with, so we really have to look in slightly unconventional places. With its level of performance and the goodies it sports inside, it can easily compete with models like the Porsche Macan, BMW X3, and Jaguar F-Pace, at least on one front or another. With things like an Alcantara-trimmed interior, backlit logos, and the digital instrument cluster, there’s no denying that the Ateca has what it takes to compete inside. And, it’s not exactly an ugly duckling on the outside either. We don’t have specific interior and exterior specs, so we need to focus on price point and performance for an accurate comparison. With that said, we’ll start out with the Jaguar F-Pace. In base form, the F-Pace doesn’t stand a chance against the Ateca. From Base to R-Sport trim, the F-pace delivers just 247 ponies from its 2.0-liter four-banger. The R-Sport is the best looker, so it’s the one that would go against the Ateca. With subpar horsepower and a $54,175 price point, the F-Pace R-Sport doesn’t really tickle our ribs as the one to go with. If you really want to compete, you have to go with the more luxurious and more powerful Portfolio trim. Coming in at a stout $62,000 – at least $4,000 more than the Ateca base price – you will get the same amount of horsepower, 296 ponies, and 295 pound-feet of torque. Not a bad choice but slightly more expensive. And, in a race, it’s going to lose as it takes the F-Pace Portfolio 5.7 seconds to get to 60 mph and it tops out at 145 mph. In this case, the Cupra Ateca may be the way to go – plus, you get in on an all-new model, so there’s that. 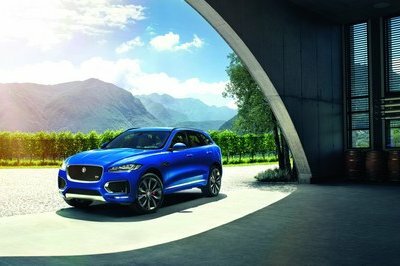 Read our full review on the 2017 Jaguar F-Pace. While the base model Macan really isn’t available here in the states, there is a lesser model available in other markets, and it’s right on par when you look at luxury. Outside of that, you might find yourself swaying more and more toward the Cupra. For instance, the Porsche Macan, in base form, comes in at $64,118 (based on exchange rates against £45,915 at the time of this writing) and only delivers an inferior 252 horsepower. That’s enough for a 6.7-second sprint to 62.1 mph and a top speed of just 142 mph. Of course, going with the Cupra will leave you on the sidelines when it comes to awesome Porsche design. If you’re a loyal Porsche customer, you couldn’t be blamed for sticking to your brand, but you should give the Cupra a test drive to see what you think. 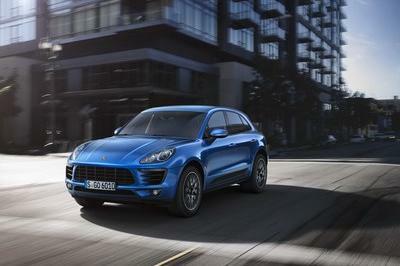 Read our full review on the 2017 Porsche Macan. The BMW X3 is the only model of the three discussed here that really makes sense in terms of favoritism. It’s available in the states in just two forms – one with 248 horsepower and one with 355 ponies. The base model, the xDrive30i, doesn’t offer as much power but it also comes in at just $42,650 – a significantly lower price. It may not have matching Alcantara inside or all of those M-specific goodies, but it’s still a better deal than the Cupra if you don’t need anything extra nice or more power. 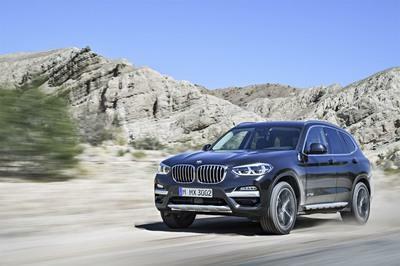 You could, of course, go for the X3 M40i, which will net you a twin-turbo inline-six that’s good for 355 horsepower. It has a price tag of $54,000 – a figure that’s right in the range the Cupra Ateca should fall in. By the way, that M40i will get you to 60 mph in 4.6 seconds on the way to a top speed of 155 mph. All told, unless you really want a rebadged SEAT with a Cupra badge and loads of Alcantara, you may want to go with that X3 M40i, but we’ll let you do the test drives and figure it out for yourself. Read our full review on the 2018 BMW X3. While we normally don’t go for all of the rebadged, performance brand makeovers, this one actually seems to hit all the right keys. It’s got the luxury features to put it ahead of its class, it’s got enough power to stand up to the big boys, and it’s got the looks too. With the price point still unknown, however, it’s really hard to place a definite answer on how well it will really be taken on the market – after all, if Cupra positions it too high, it will be quite easy to turn eyes to another big brand with as much power and a lower price. For now, we’ll just have to wait and see but, so far, things are looking good for the new Cupra brand. Read our full review on the standard 2017 Seat Ateca. Read our full review on the 2016 Ateca X-Perience Concept. 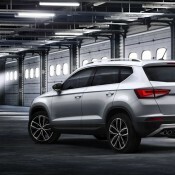 Cupra’s first model, the Cupra Ateca, comes to the market with 296 horsepower, a new seven-speed DSG transmission, all-wheel-drive system, and it even has an Otto Particulate Filter System to combat those pesky emissions. 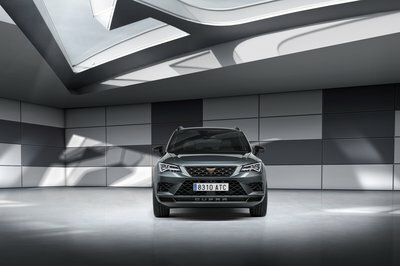 This is the first model from the Cupra brand now that it has split away from SEAT, and it will be followed by models like the Cupra Arona, Cupra TCR race car, and the Cupra Ibiza. 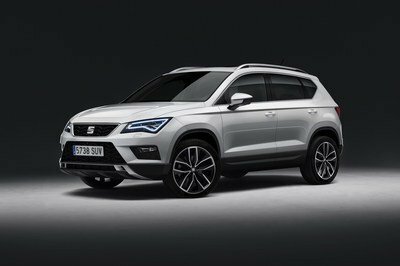 What is the Difference in Performance Between the Cupra Ateca and the SEAT Ateca? 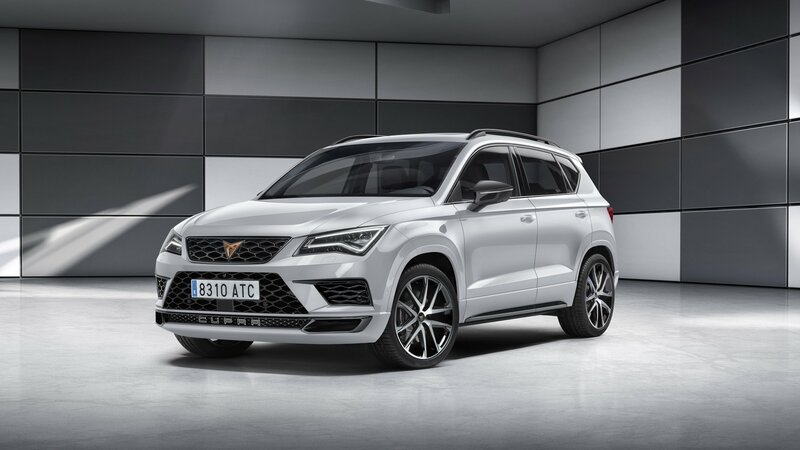 The Cupra Ateca comes to the market with 296 Horsepower compared to the maximum 187 horsepower offered by the same engine in the SEAT model. Both use TSI direct injection and a DSG seven-speed transmission, however, Cupra is said to have revised the gearbox for smoother, faster shifts, and more precise gear changes. 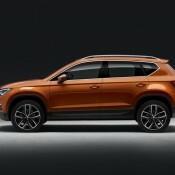 Both the Cupra and SEAT models have 4Drive AWD and, while both benefit from multiple drive modes like “normal,” “sport,” “snow,” and “offroad,” the Cupra Ateca gets a special “CUPRA” mode that unlocks better engine response, engine sound, and adjusts the adaptive suspension for sportier handling. 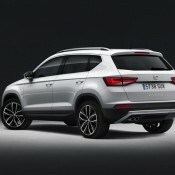 The Cupra Ateca can hit 100 kph (62.1 mph) in 5.4 seconds and tops out at 245 kph (152 mph). Does the Cupra Ateca Look Different Than the SEAT Ateca? For the most part, the Cupra Ateca and SEAT Ateca are nearly identical outside. Both models even have the same grille styling and mesh. 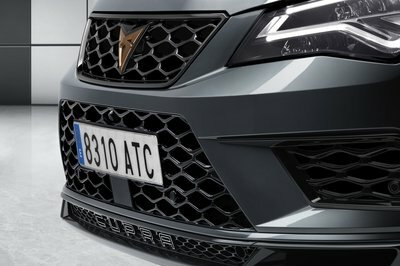 The Cupra Model gets the same mesh inside the corner vents of the front fascia (as opposed to fog lamps) while the lower lip of the Cupra model has been revised to include the Cupra logo and an extra intake in either corner. The side mirrors are finished black as opposed to the SEAT model’s body coloring. In the rear, the two models are differentiated by a revised rear fascia. The Cupra Ateca gets a diffuser-like element with twin, dual exhaust outlets. Does the Cupra Ateca have a Different Interior Design? The base interior design of the Cupra Ateca is carried over from the SEAT model, however, it’s the little things that separate the two design-wise. The Cupra Ateca is upholstered primarily in Alcantara, with the seats and door trim panels being the primary recipients. The door sills of the Cupra Ateca also feature an illuminated logo while the steering wheel is wrapped in leather and perforated. The steering wheels, gear shifter, and seats all get grey contrast stitching. 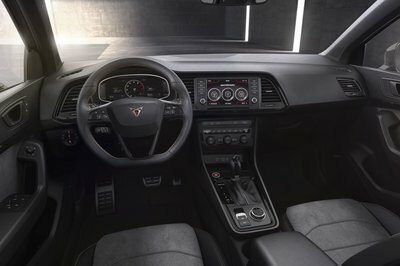 There are also aluminum pedals and aluminum frames around the air vents and A/C controls, while the infotainment system features updated software with a Cupra logo and performance page as seen in the image above. 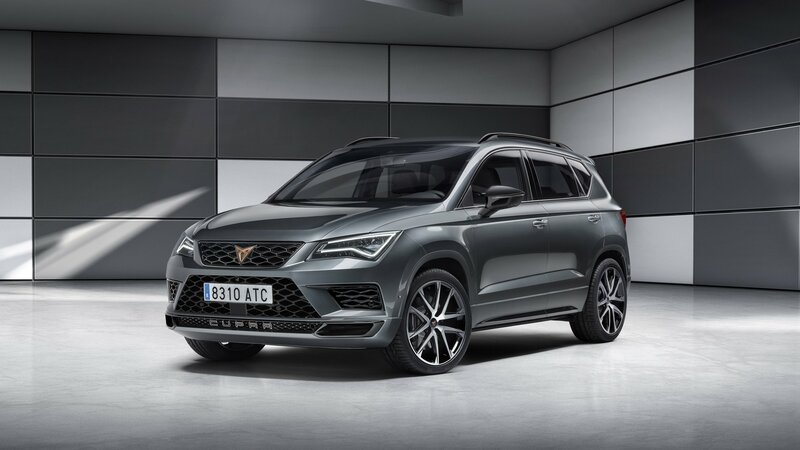 What are the Standard Features of the Cupra Ateca? 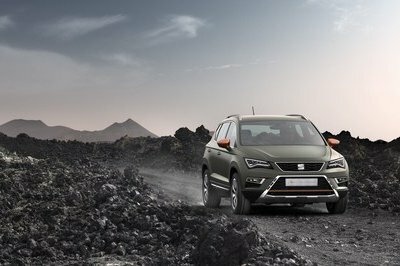 The Cupra Ateca is focused around merging technology and safety. As such, it receives a keyless entry and start system, eight-inch touchscreen infotainment system, and a digital instrument cluster. Other features, generally left as optional equipment on the SEAT model, include a wireless charger, GSM Signal booster, 360-degree top-view camera, adaptive suspension, and park assist. What Optional Features are Available for the Cupra Ateca? The Cupra Ateca can be equipped with the “Performance Pack,” a package that includes 18-inch Brembo brakes with a black finish. There’s also a “Carbon Fiber” pack for the exterior that includes a carbon fiber spoiler and mirror caps. Finally, the Carbon Fiber Interior Pack will give you a carbon fiber dashboard with leather seats. Cupra bucket seats will be available sometime in mid-2019. How Much Does the Cupra Ateca Cost? 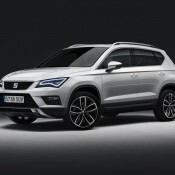 Pricing has yet to be announced as of February 2018, but with the SEAT Ateca XCellence topping out at around $44,000 at current exchange rates (2-22-2018,) the Cupra Ateca will likely carry a base price somewhere in the $50,000 to $55,000 range. 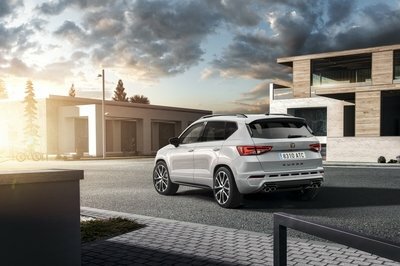 Should I Buy a Cupra Ateca instead of a SEAT Ateca? You should buy a Cupra Ateca if you’re in the market for a compact crossover with decent performance. If you’re not looking from the benefit of having 296 horsepower and slightly more aggressive looks, or aren’t worried about having leather and Alcantara inside, then you’re probably better off going with a SEAT-branded model. 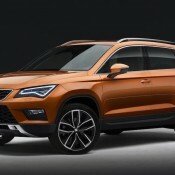 In an effort to see what the sporty version of the new SEAT Ateca SUV, revealed only a few days ago, will look like, designer X-Tomi has penned this Cupra version. 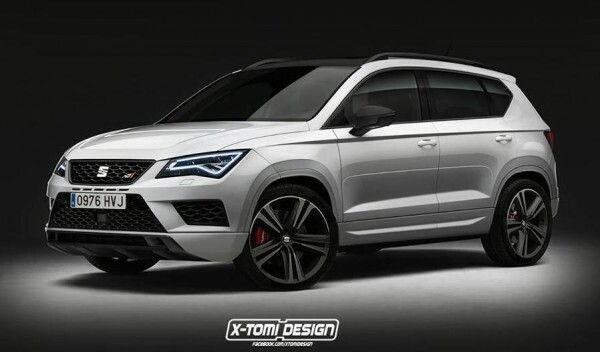 The car maker has not confirmed yet they are going to make a Cupra Ateca, but if they do, chances are it’ll look pretty close to what you see here. To design his SEAT Ateca Cupra, Tomi has drawn inspiration from the existing SEAT Cupra model. It can be seen in the shape of the front bumper with its large air intakes and mesh grille as well as the chunky side skirts. This being a SUV, he’s also added the new underbody protection component which double as styling elements. Naturally for a Cupra, the car also gets lowered suspension, larger wheels, and better brakes with red calipers. As for the engine the real, production SEAT Ateca Cupra would get, by today’s standards it should be a 2.0 liter turbocharged with well over 200 horsepower. But who knows what will happen by the time this model is ready to launch. 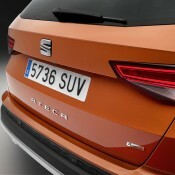 By then SEAT may be using a 1.6 or a 1.4 turbo engine in their high-performance model. But rest assured whatever engine size becomes the trend, the power figure won’t diminish below the current level. The post SEAT Ateca Rendered in Cupra Guise appeared first on Motorward. 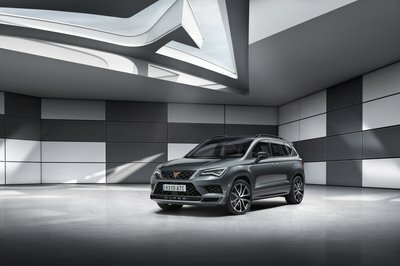 So after years of indecision, research, and trial and error, Spanish car maker finally unveiled their first production SUV last night in Barcelona. The 2017 SEAT Ateca SUV is a new take on the firm’s emotional design language in a much larger than usual scale. And it looks good. You get all the traditional design features here. 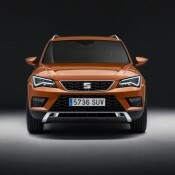 SEAT Ateca has trapezoidal grille, the side blisters have sharp creases and the triangular light signatures, and there are optional full-LED headlights. 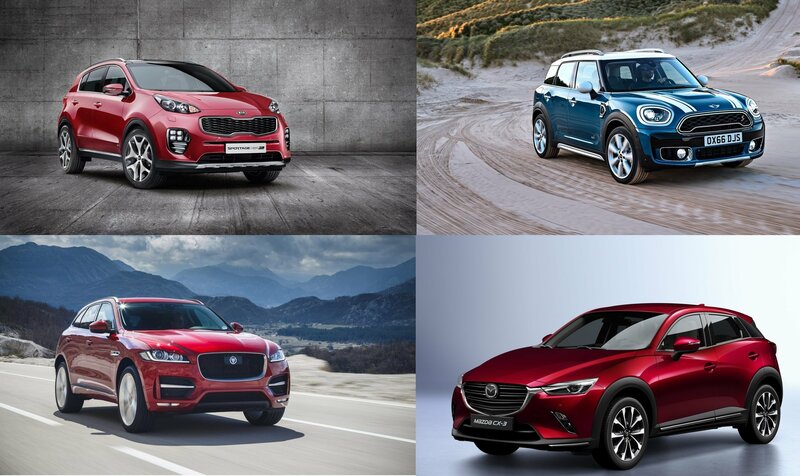 In fact, some people may criticize the SUV for looking too like a Leon. But the good thing about this similarity is that it makes the SUV look rather sporty and fun. The same goes for the interior. 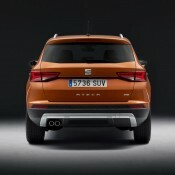 Two main highlights of the new SEAT Ateca include safety and connectivity features . The first one is taken care with a full host of advanced features, such as Traffic Jam Assist which is a semi-autonomous mode that lessens the fatigue of driving in traffic, Emergency Assist which is a drowsiness aversion system, and the more common technologies like Front Assist, Traffic Sign Recognition, Blind Spot Detection, Rear Cross Traffic Alert and Top View Camera. 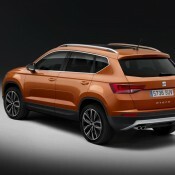 Connectivity features in the Ateca include Media System Plus with an eight-inch screen, Connectivity Box in the centre console with wireless smartphone charging and SEAT Full that integrates all known smartphones into the system. 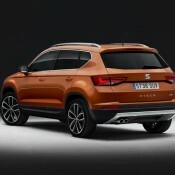 as for the dynamics and performance, SEAT Ateca launches in Europe with a range of engines including 1.6 TDI (115 PS) and 2.0 TDI (150 and 190 PS) diesels, and 1.0 TSI (115 PS) and 1.4 TSI (150 PS) petrol units. The latter also has cylinder de-activation system. The drivetrain, depending on the option, consists of either front-wheel or all-wheel-drive, and a manual or dual-clutch DSG transmission. 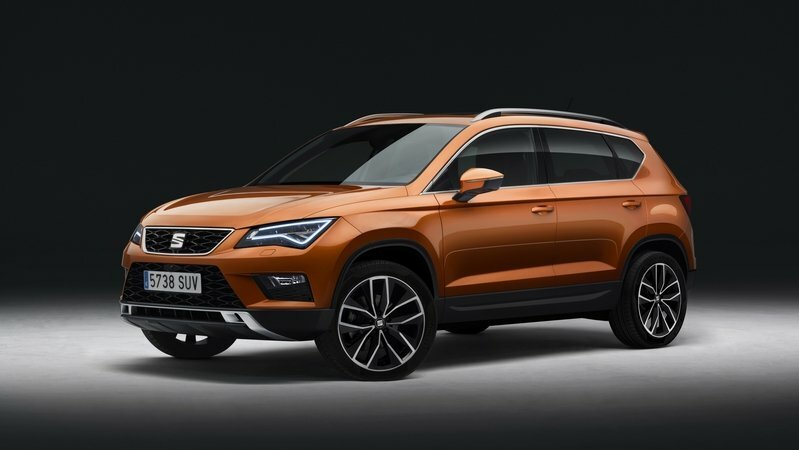 The post SEAT Ateca SUV Officially Unveiled appeared first on Motorward.